Pendle Hill’s Kitchen/Garden Intern Stacy Nagel adapted this recipe and baked it for guests and residents. 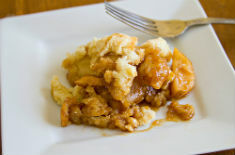 It’s a delicious way to serve those older apples that sit neglected in many refrigerators in March. Enjoy! Stir together the molasses, water, lemon juice, nutmeg, cinnamon, vanilla, and salt. Add the apples, cranberries, and walnuts and stir to coat. Stir in the flour and sugar. Transfer to a 9” square pan. Bake covered with foil for 25 minutes. Whisk together the flour, baking powder, salt, and 1 tsp of the sugar. Blend in the butter with your fingertips until the mixture resembles coarse meal. Add the cream and stir with a fork just until the dough forms. Spread or pat the dough lightly on top of the fruit filling. Brush with a little extra cream and sprinkle with the remaining 2 tsp sugar. Bake, uncovered, until the biscuit is golden, about 30 minutes. Serve with fresh cream. Serves 6.